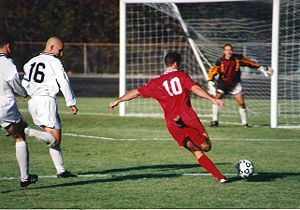 A player in red has penetrated the defense and is taking a shot at the goal, which the goalkeeper will attempt to stop. Association football, commonly known as football or soccer, is a team sport played between two teams of 11 players each. It is widely considered to be the most popular sport in the world. Soccer is played on a rectangular grass field—also called a pitch—or, occasionally, on artificial turf, with a goal at each end of the field. The object of the game is to score by maneuvering the ball into the opposing goal. Only the goalkeeper may use his hands or arms to propel or catch the ball in general play. The team that scores the most goals by the end of the game wins. If the score is tied at the end of the game, either a draw is declared or the game goes into extra time and/or a "shootout" takes place to determine the winner, depending on the format of the competition. Soccer rouses powerful passions and is a valuable outlet for aggressive energy for millions of players in amateur, but highly-competitive, local soccer leagues throughout much of the world. The number of women playing the game is but a small fraction of the number of male players. Soccer players' passions can be harnessed for the purpose of building peace and have even brought war to a temporary end. Soccer fans also experience strong emotions that are expressed vigorously during the games. Although there is tremendous good in soccer, it can be corrupted as well, especially at the professional level, through such activities as the involvement of organized crime syndicates betting on the games and bribing referees or players to throw games. Such allegations are somewhat common in Europe, but convictions are much less common. On very rare occasions, a competition involving opposing teams representing countries carrying historical grievances between them has seen the fans' passions tragically flare into uncontrolled and even deadly mob violence. For the majority of soccer players and fans, soccer satisfies a need within them. It has been called "the beautiful game" by some, and by others it has been called the "simple game" because of the lack of equipment needed and the simplicity of its rules. Soccer is the sport of the common man that has been embraced by all. Like music, soccer is a language of the world, a passionate sport with a universal appeal. It is theater of the highest order, a mixture of art, beauty, and conflict performed on a stage where skill, athletics, and unity of mind and body is paramount. In the twenty-first century, soccer is increasingly being used as a peace building instrument both at the international level and locally for youths in areas of traditional conflict between rival groups. Football/soccer is played using a single round ball, and two teams of 11 players compete to get that ball into the other team's goal, thereby scoring a point. The primary rule of soccer is that the players (other than the goalkeeper) may not intentionally touch the ball with their hands or arms during play, except during a throw-in restart after a ball has gone out of bounds. Players usually use their feet to move the ball, but they may use any part of their bodies other than their hands or arms. Using the head is a frequently applied skill, both to block shots and passes, and in scoring goals when a ball is passed to a potential scorer through the air. Only the goalkeeper may legally use his hands while the ball is in play. In typical game play, players attempt to propel the ball toward their opponent's goal through individual control of the ball, such as by dribbling, passing the ball to a teammate, and taking shots at the goal, which is guarded by the opposing goalkeeper. Opposing players may try to regain control of the ball by intercepting a pass or through "tackling" the opponent who controls the ball. However, physical contact between opponents is limited. In tackling, the ball must be played first, before contact with the opposing player is made; and tripping a player without playing the ball first is a foul. Soccer is generally a free-flowing game, with play stopping only when the ball has left the field of play, or when play is stopped by the referee. After a stoppage, play recommences with a specified restart. At a professional level, most matches produce only a few goals. For example, during the English Premier League 2005-06 season, an average of 2.48 goals per match were scored. The Laws of the Game do not specify any player positions other than goalkeeper, but a number of soccer positions have evolved. Broadly, these include three main categories: Strikers, or forwards, whose main task is to score goals; defenders, who specialize in preventing their opponents from scoring; and midfielders, who dispossess the opposition and keep possession of the ball in order to pass it to the forwards. These positions are further differentiated by which side of the field the player usually occupies. The players other than the "goalie" may be arranged in a number of combinations. For example, there may be four defenders, four midfielders, and two forwards, known as the 4-4-2 formation; or three defenders, five midfielders, and two forwards, known as the 3-5-2 formation. The number of players in each position determines the style of the team's play. More forwards and fewer defenders would create a more aggressive and offensive-minded game, while the reverse would create a slower, more defensive style of play. While players may spend most of the game in a specific position, there are few restrictions on player movement and players can switch positions at any time. The layout of the players on the pitch is called the "team's formation," and defining the team's formation and tactics is usually the role of the team's manager or coach. Games revolving around the kicking of a ball have been played in many countries throughout history. According to FIFA, the "very earliest form of the game for which there is scientific evidence was an exercise… dating back to the second and third centuries B.C.E. in China." In addition, the Roman game Harpastum may be a distant ancestor of soccer. Various forms of soccer were played in medieval Europe, although rules varied greatly by both period and location. The sophisticated form of modern soccer originated in Great Britain. While soccer has continued to be played in various forms throughout Britain, the English public schools (fee-paying schools) are widely credited with certain key achievements in the creation of modern soccer and rugby. The evidence suggests that during the sixteenth century, Richard Mulcaster, the principal of Merchant Taylors' School in London, was instrumental in transforming soccer from a violent "mob" sport into an organized team competition considered beneficial to schoolboys. The game soon became institutionalized, regulated, and part of a larger tradition. Finally, in the nineteenth century, teachers and former students wrote down formal rules of early modern soccer to enable matches to be played between schools. The rules of soccer as they are codified today are effectively based on these efforts. The first known set of soccer rules was written at Eton College in 1815. The Cambridge Rules were first drawn up at Cambridge University in 1848. 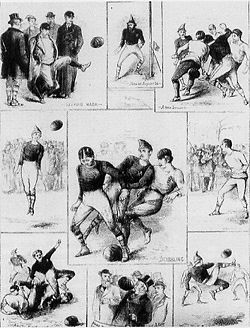 These and other efforts contributed to the formation of The Football Association (FA), which first met on the morning of October 26, 1863, at the Freemason's Tavern on Great Queen Street in London. The Freemason's Tavern was the setting for five more meetings between October and December, which eventually produced the first comprehensive set of rules. Paul Gardner, in his landmark book, The Simplest Game: The Intelligent Fan's Guide to Soccer, writes: "If there is a date marking the birthday of soccer, then it is December 8, 1863. The day the F.A. published its first set of rules—the day the F.A. banned running with the ball and hacking." At the final meeting, the representative from Blackheath withdrew his club from the FA over the inclusion of these rules. Other English rugby clubs followed suit, and would not join the FA. Instead, in 1871, they formed the Rugby Football Union. The 11 remaining clubs, under the leadership of Ebenezer Cobb Morley, went on to ratify the original 13 laws of the game. The world's oldest football competition is the FA Cup, which was founded by C. W. Alcock and has been contested by English teams since 1872. The first official international soccer match also took place in 1872, between Scotland and England in Glasgow, again at the instigation of C. W. Alcock. England is home to the world's first soccer league, which was founded in 1888, by William McGregor, the director of Birmingham-based team, Aston Villa. The original format of the league contained 12 clubs from the Midlands and the North of England. The Laws of the Game are currently determined by the International Football Association Board (IFAB), formed in 1886, after a meeting in Manchester of The Football Association, the Scottish Football Association, the Football Association of Wales, and the Irish Football Association. The Fédération Internationale de Football Association FIFA, the international governing body of soccer, was formed in Paris in 1904, declaring that it would adhere to the Laws of the Game published by the FA. The growing popularity of the international game led to the admittance of FIFA representatives to the International Football Association Board in 1913. The board currently consists of four representatives from FIFA and one representative from each of the four British associations. Soccer reached America with the Puritans and other early settlers. The first soccer club established outside Great Britain was the Oneida Football Club, formed near Boston in 1862. Soccer was the main sport of the Ivy League universities before they started playing American gridiron football. The first ever intercollegiate college football game, held in 1869 between Princeton and Rutgers, was a soccer game played according to the English Football Association rules. For the next three years, "the dribbling or kicking game" was played at Princeton, Columbia, Yale, and Rutgers. Harvard was undecided between the "dribbling game" and the "handling game," the latter of which was played in England as rugby. In 1874, the Harvard team traveled to McGill University in Montreal, to play two games, the first under soccer rules with a round ball and the second under rugby rules with an egg-shaped ball. Harvard easily won the first game but was held to a tie in the second. However, the "handling game" so impressed the Harvard men that they adopted the rugby rules. Before long, Harvard had converted the other American colleges to its new game, which gradually was fashioned into the American gridiron football of today. The first battle to implant soccer in America may have been lost, but soccer did not disappear. Leagues formed on the Eastern Seaboard and in St. Louis, with teams such as the Brooklyn Celtics, Spanish-American F.C., and Anglo-Saxon F.C. Ethnic Americans continued to play the sport of their homeland and forefathers and the United States sent a team to the first-ever World Cup and also appeared in the 1938 contest. In 1994, the United States hosted the World Cup. Map showing the popularity of soccer around the world. Countries where soccer is the most popular sport are colored green, while countries where it is not are colored red. The various shades of green and red indicate the number of players per 1,000 inhabitants. Today, soccer is played at a professional level all over the world, and millions of people regularly go to soccer stadiums to follow their favorite team. A very large number of people also play soccer at an amateur level. According to a 2001 FIFA survey, over 240 million people regularly play soccer in more than 200 countries, in every part of the world. Soccer's simple rules and minimal equipment requirements have aided its spread and growth in popularity. In many parts of the world soccer evokes great passions and plays an important role in the life of individual fans, local communities, and even nations. It is considered to be the most popular sport in the world. Soccer has often been a force for peace and reconciliation. In 2002, longtime enemies Japan and South Korea successfully played host to the World Cup. Old rivals Holland and Belgium played host to the 2000 European Championship, and even ancient enemies, Greece and Turkey made a bid—albeit unsuccessful—to play host to 2008 European Championship. Soccer has even stopped wars. On Christmas Day 1914, German and British troops on the front lines during World War I put down their guns, came out of their muddy trenches, and played a soccer game. According to one soldier's diary report, the Germans won 3-2. In 1969, Brazilian star Pele's trip to Nigeria with his club, Santos, produced a three-day cease-fire in the Biafran War. In 1990, rival factions in the Lebanon War took time out from killing each other to watch World Cup games beamed in from Italy. It was widely reported that the Côte d'Ivoire national soccer team helped secure a truce to the nation's religiously based civil war in 2005 after a team, consisting of both Christians and Muslims, qualified for the World Cup. However, passions for the game can also result in riots between the fans of supporting rival teams, sometimes reaching the international level. Soccer is widely considered to have been the cause of the so-called Football War in June 1969, between El Salvador and Honduras. The sport also exacerbated tensions at the beginning of the Yugoslav Wars of the 1990s, when a match between Red Star Belgrade and Dinamo Zagreb devolved into rioting, in March 1990. There are 17 rules in the official Laws of the Game. The same rules are designed to apply to all levels of soccer, although certain modifications for groups such as juniors, seniors, or women are permitted. The laws are often framed in broad terms, which allow flexibility in their application depending on the nature of the game. In addition to the 17 laws, numerous IFAB decisions and other directives contribute to the regulation of football. The laws can be found on the official FIFA website. Each team is allowed a maximum of eleven players, excluding substitutes, one of whom must be the goalkeeper. Competition rules may state a minimum of seven players are required to constitute a team. However, informal neighborhood "pickup" games are often played with less. 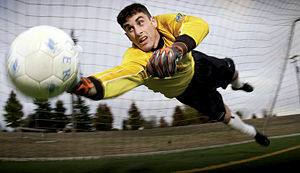 Goalkeepers are the only players allowed to play the ball with their hands or arms, but they are allowed to do so only within the "penalty area" in front of their own goal. Though there are a variety of positions in which the outfield (non-goalkeeper) players are strategically placed by a coach, these positions are not defined or required by the Laws. 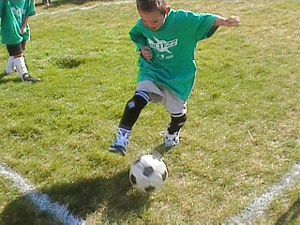 The basic equipment (kit) players are required to wear includes a shirt, shorts, socks, footwear, and adequate shin guards. Players are forbidden to wear or use anything that is dangerous to themselves or another player, including jewelry or watches. The goalkeeper must wear clothing that is easily distinguishable from that worn by the other players and the match officials. A number of players may be replaced by substitutes during the course of the game. The maximum number of substitutions permitted in most competitive international and domestic league games is three, though the number may be varied in other leagues or in "friendly" matches. Common reasons for a substitution include injury, fatigue, ineffectiveness, or a tactical switch. In standard adult matches, a player who has been substituted may not take further part in the match. A game is officiated by a referee, who has "full authority to enforce the Laws of the Game in connection with the match to which he has been appointed" (Law 5), and whose decisions are final. The referee is assisted by two assistant referees. In many high-level games there is also a fourth official (and in the World Cup a fifth official), who assist(s) the referee and may replace another official should the need arise. 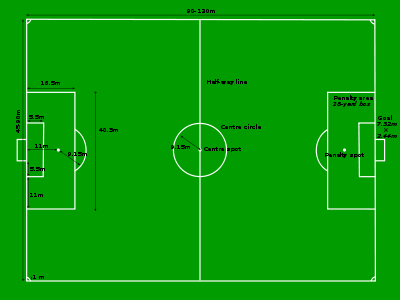 The length of the pitch specified for international adult matches is in the range of 110-120 yards and the width is in the range of 70-80 yards. Fields for non-international matches may be 100-130 yards in length and 50-100 yards in width, provided that the pitch does not become square. The longer boundary lines are "touchlines" or "sidelines," while the shorter boundaries (on which the goals are placed) are "goal lines." On the goal line at each end of the field a rectangular goal is centered. The inner edges of the vertical goal posts must be eight yards apart, and the lower edge of the horizontal crossbar supported by the goal posts must be eight feet above the ground. Nets are usually placed behind the goal, but are not required by the Laws. In front of each goal is an area of the field known as the penalty area, often referred to as the "18-yard box" or simply "the box." This area is marked by the goal-line, two lines starting on the goal-line 18 yards from the goalposts and extending 18 yards into the pitch perpendicular to the goal-line, and a line joining them. This area has a number of functions, the most prominent being to mark where the goalkeeper may handle the ball and where a penalty foul by a member of the defending team becomes punishable by a penalty kick—awarding an unobstructed free kick toward the goal from a distance of 11 meters. The field has various other markings and defined areas. Fourth official signals a substitution. A standard adult football match consists of two periods lasting 45 minutes each, known as halves. There is usually a 15-minute "half-time" break between them. The end of the match is known as full-time. Each half runs continuously, meaning that the clock is not stopped when the ball is out of play. The referee is the official timekeeper for the game, and may make an allowance for time lost through substitutions, injured players requiring attention, or other stoppages, such as players trying to "waste time." This added time is commonly referred to as "stoppage time," "extra time," or "injury time," and is at the sole discretion of the referee. The referee alone signals the end of the match. 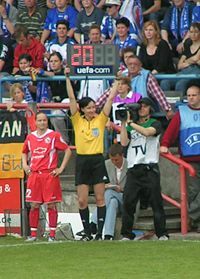 In matches where a fourth official is appointed, near the end of the half the referee signals how many minutes of stoppage time he intends to add, and the fourth official then informs the players and spectators by holding up a board showing this number. The signaled stoppage time may be further extended by the referee. In league competitions, games may end in a draw, but in some competitions, it may go into extra time, consisting of two additional 15-minute periods. If the score is still tied after extra time, some competitions allow the use of penalty shootout (known officially in the Laws of the Game as "kicks from the penalty mark") to determine which team will progress to the next stage of the tournament. Goals scored during extra time periods count toward the final score of the game, but kicks from the penalty mark are only used to decide the team that progresses to the next part of the tournament, with goals scored in a penalty shootout not making up part of the final score. In international games, a penalty-shoot win is listed as a tie in the record book. Competitions held over two "legs"—meaning two games in which each team plays at home once—may use the "away goals" rule to determine which team progresses in the event of equal aggregate scores. If the result is still equal following this calculation, kicks from the penalty mark are usually required. In the late 1990s, the International Football Association Board experimented with ways of making games more likely to end without requiring a penalty shootout, which was often seen as an undesirable way to end a match. These involved rules ending a game in extra time early, either when the first goal in extra time was scored, known as the "Golden Goal," or when one team held a lead at the end of the first period of extra time, known as the "Silver Goal." The Golden Goal was used at the 1998 World Cup in France and the 2002 World Cup hosted by Japan and South Korea. At the European Championship of 1996, Germany was the first nation to score a Golden Goal in a major international competition, beating the Czech Republic in the final. The silver goal was used in Euro 2004 in Portugal. Both these experiments have been discontinued by IFAB. 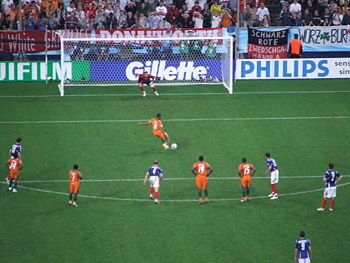 A player attempts a penalty kick during the 2006 World Cup. Throw-in: When the ball has wholly crossed the touchline; awarded to the team which was not last to touch the ball. Indirect free kick: Awarded to the opposing team following "non-penal" fouls, technical infringements, or when play is stopped to caution or send off an opponent. A goal may not be scored directly from an indirect free kick. Direct free kick: Awarded to fouled team following certain listed "penal" fouls. Opposing players are entitled to obstruct a direct free kick from a distance of approximately ten yards from the spot of the kick. Penalty kick: Awarded to the fouled team following a "penal" foul within its opponent's penalty area, consisting of a direct, unobstructed free kick to the goal from 11 meters away. Dropped-ball: Occurs when the referee has stopped play for any other reason (e.g., a serious injury to a player, interference by an external party, or a ball becoming defective). This restart is uncommon in adult games. Players in red line up for a direct free kick, while opposing players prepare to obstruct it. A foul occurs when a player commits a specific offense listed in the Laws of the Game while the ball is in play. The offenses that constitute a foul are listed in Law 12. Handling the ball, tripping an opponent, pulling an opponent's jersey, and pushing an opponent are examples of "penal fouls," punishable by a direct free kick or a penalty kick depending on where the offense occurred. Non-penal fouls are punishable by an indirect free kick, meaning that the player must pass the ball rather than shooting it directly toward the goal. For serious or intentional fouls, a referee may punish a player with a caution (yellow card) or sending-off (red card). A second yellow card in the same game leads to a red card, and therefore to a sending-off. Misconduct may occur at any time, and while the offenses that constitute misconduct are listed, the definitions are broad. In particular, the offense of "unsporting behavior" may be used to deal with most actions that violate the spirit of the game, even if they are not listed as specific offenses. Non-players, such as managers and support staff, may be dismissed from the field and its surrounds by the referee if they fail to conduct themselves in a responsible manner. After being sent off, a player may not be replaced, resulting in the offending team playing at a one-man disadvantage. Rather than stopping play when a foul occurs, the referee may allow play to continue when its continuation will benefit the team against which the offense has been committed. This is known as the "advantage rule." The referee may call back play and penalize the original offense if the anticipated advantage does not ensue within a short period of time. Even if an offense is not penalized because the referee plays an advantage, the offender may still be sanctioned with a yellow card or red card at the next stoppage of play. The "offside" law effectively limits the ability of attacking players to remain forward (i.e. closer to the opponent's goal-line) of the ball when the attacker is also forward of the second-to-last defending player including the goalkeeper, and past beyond the field's half-way line. The recognized international governing body of soccer (and associated games, such as beach soccer) is the Fédération Internationale de Football Association FIFA. FIFA's headquarters is located in Zürich, Switzerland. The recognized national associations oversee football within their jurisdictions. These are affiliated both with FIFA directly and also with their respective continental confederations. The major international competition in football is the World Cup, organized by FIFA. This competition takes place over a four-year period. More than 190 national teams compete in qualifying tournaments within the scope of continental confederations for a place in the finals. The finals tournament, which is held every four years, involves 32 national teams competing over a four-week period. The 2006 FIFA World Cup took place in Germany and its 2010 venue is South Africa. A soccer tournament has been played at all the Summer Olympic Games since 1900, except at the 1932 Summer Olympics held in Los Angeles. Before the inception of the World Cup, the Olympics (especially during the 1920s) had the same status as today's World Cup. Originally, the event was for amateurs only, however, since the 1984 Summer Olympics, professionals have been permitted as well, albeit with certain restrictions which effectively prevent countries from fielding their strongest sides. Currently, the Olympic men's tournament is played at the under-23 level. A women's tournament was added in 1996 and in contrast to the men's event, the women's Olympic tournament is played by full international sides without age restrictions. It thus carries international prestige comparable to that of the FIFA Women's World Cup. Aside from the World Cup and the Summer Olympic Games, national level teams have few other opportunities for international level competition. They do, however, have active competition for continental championships organized by each continental confederation. These are the European Championship (UEFA)—Europe, the Copa América (CONMEBOL)—South America, African Cup of Nations (CAF)—Africa, the Asian Cup (AFC)—Asia, the CONCACAF Gold Cup (CONCACAF)—North, Central America and Caribbean, and the OFC Nations Cup (OFC)—Oceania. At the club level, two of the most highly regarded competitions traditionally are those for the championship of the UEFA Champions League in Europe and the Copa Libertadores de América in South America. Until 2005, the most prestigious club championship was the Intercontinental Cup, which was also known as the Toyota Cup and was played annually in Japan. It was contested by the winning club of the European Champions League and the winner of the Copa Libertadores. Due to the growing interest of people from Africa, North America, and Asia in club-level football, this championship in 2005 became a part of the new FIFA Club World Championship, a tournament between the club championship winners from each of the six FIFA confederations. The new tournament is also held in Japan annually up through 2008, with bidding opening for the 2009 host site. The possibility of using soccer as a peace-building instrument has been recognized for at least a century and the impulse continues to emerge independently, among individuals and groups in different parts of the world. The Peres Center for Peace organizes soccer matches between top-ranked international teams and a joint Israeli-Palestinian team, while a different Soccer for Peace program organizes soccer competitions between Arab and Jewish children in Israel. The latter is a joint undertaking of the Maccabim Association and the Kibbutz Barka’i Center for Soccer, Peace, and Coexistence. A Soccer for Peace program organized out of Emory University in Atlanta, Georgia, sends soccer equipment to such places as Darfur, so peacekeepers and refugees can play soccer together. Starting in 2006, national women's teams have had the possibility of entering the Peace Queen Cup, a competition held in South Korea and involving eight women's national teams representing five continents. The first tournament is scheduled to be held once every two years. The Peace Queen Cup is a companion program to the World Peace Cup, an international level competition involving eight of the world's top-ranked club teams, also competing in Korea. The World Peace Cup and Peace Queen Cup are scheduled in alternate years. Organized by the Sunmoon Peace Football Foundation, the pair of international competitions represent an effort to harness the energy and goodwill of football to promote the unity of humankind and help realize a world of peace. Proceeds from the tournaments are contributed to the World Organization of NGOs (WANGO) in support of its "Play Soccer, Make Peace" program, which organizes and supports local soccer competitions among youth from traditionally opposing groups in more than 30 countries. 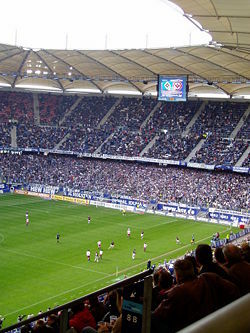 A match in Hamburg, Germany, May 2004. The governing bodies in each country operate league systems, normally comprising several divisions, in which the teams gain points throughout the season depending on results. Teams are placed into tables, putting them in order according to points accrued. Most commonly, each team plays every other team in its league at home and away in each season, in a round-robin tournament. At the end of a season, the top team is declared the champion, and the top few teams may be promoted to a higher division, while one or more of the teams finishing at the bottom are relegated to a lower division. For example, in the English Premier League (EPL), the bottom three teams drop down into the second division, while the top three teams move up to the EPL. The teams finishing at the top of a country's league may also be eligible to play in international club competitions in the following season. One exception to this system occurs in some Latin American leagues, which divide championships into two sections named Apertura and Clausura (opening and closing), awarding a champion for each. Another exception is Major League Soccer in the United States, which has a playoff system. In addition to a league system, most countries operate one or more cup competitions during the season. These are organized on a knock-out basis, the winner of each match proceeding to the next round, while the loser is eliminated. Some countries' top divisions feature highly-paid star players, but in smaller countries and lower divisions, players may be part-timers with a second job, or amateurs. Top players from nations where soccer is not a well-developed sport gravitate to the higher-paying clubs. The five top European leagues—the English Premier League, the Bundesliga, La Liga, Ligue 1, and Serie A—attract most of the world's best players. Manchester United in the EPL and Real Madrid in La Liga, are two of the biggest clubs in the world. The dedicated fan base of soccer that has supported the spread of club football from its home in Europe to South America and then to the other continents, has also attracted corporate and governmental support both for soccer clubs and for competitions between clubs. In South Korea, for example, club soccer is a major business investment with corporations like Samsung, Hyundai, LG, Ilhwa, and SK each supporting their own club team since the 1980s. Starting in 1997, cities including Daejeon, Daegu, Incheon, and Gyeongnam also have each launched their own club team. Historical restrictions on the number of foreign players in a club's team have been largely eliminated by the Bosman ruling, a 1995 European Court of Justice decision that allowed soccer players to move freely to another club at the end of their term of contract with their present team. ↑ BusinessWeek, "Adidas' World Cup Shutout." Retrieved August 25, 2007. ↑ Sportpress.com, England Premiership. Retrieved August 30, 2007. ↑ Thefa.com, History of the Football Association. Retrieved August 30, 2007. ↑ Football League, The History Of The Football League. Retrieved August 30, 2007. ↑ FIFA, The International FA Board. Retrieved August 30, 2007. ↑ FIFA, History of FIFA. www.fifa.com. Retrieved August 30, 2007. ↑ FIFA, FIFA Survey: approximately 250 million footballers worldwide. Retrieved August 30, 2007. ↑ Daniel W. Drezner, The Washington Post: "The Soccer Wars," Sunday, June 4 2006. ↑ FIFA, The Official web site of the Fédération Internationale de Football Association. Retrieved August 30, 2007. ↑ Julian Carosi, The History of Offside. Retrieved August 30, 2007. ↑ Korean Football Association, Citizens on the march! Retrieved September 17, 2007. Federation Internationale de Football Association (FIFA). www.fifa.com. Asian Football Confederation (AFC). www.the-afc.com. Confederation of African Football (CAF). www.cafonline.com. Confederation of North, Central American and Caribbean Association Football (CONCACAF). www.concacaf.com. Union of European Football Associations (UEFA). www.uefa.com. South American Football Confederation (CONMEBOL). www.conmebol.com. Oceania Football Confederation (OFC). www.oceaniafootball.com. Laws of the Game (LOTG). www.fifa.com. The Rec.Sport.Soccer Statistics Foundation (RSSSF). www.rsssf.com. Association of Football Statisticians (AFS). www.11v11.co.uk. This page was last modified on 7 October 2015, at 23:03.